"we sat ruminating on the nature of existence"
"we ruminated on the nature of existence"
(of a ruminant) chew the cud. Just to be clear: I'm chewing the cud while ruminating on the nature of existence. Have a great weekend. Spring cannot come soon enough. Just finished this medical illustration of the lateral structures of the brain for the United States Dressage Federation Connections magazine to be published in an upcoming issue. The article will be about the critical need to wear a helmet at all times when riding. Fortunately, the USDF is changing their competition rules to accommodate helmet wearing at all levels. Equestrian head/brain injuries are no joke. They can happen in an instant and change lives forever. So NOT worth the risk. Check it out. A very talented medical illustrator friend, Anita Impagliazzo, is headlining a show of her wonderful illustration work at St. Catherine's school in Richmond VA. The Mullen Hall science building first floor is filled with Anita's fantastic work in the new state-of-the art science center for high school girls. I am honored to be represented in the exhibition (2nd floor atrium) along with my peers from MediVisuals (Richmond) as well as several other independent biocommunicators. For those who believe in the furthering of science, here is "Urinary System: Kidney" ©1987 Catherine Twomey • All Rights Reserved. This comprehensive medical illustration, I am honored to say, is entering the Lloyd Museum's collection along with four other pieces. This particular illustration was done in 1987 on a beautiful sheet of Canson paper, and has a piece of clear acetate taped to the top. The acetate was imprinted using a method called PMT or "Photo Mechanical Transfer" which was very common in the 1980's but soon became obsolete (computers struck again!). So on the top is the acetate inked PMT illustration. On the flip side are very fragile and soft pastels and carbon dust. What's shown is a sectioned kidney, then to the right an enlargement of the functioning tubules of the kidney's system. The big lumpy round thing at the bottom left is actually microscopic in size, and of all things is called the glomerulus. Inside of this structure, the blood is filtered before it is sent back into the circulatory system. Taking a much needed break to sweet old home, Chicago tomorrow until next week. The fort is being held down by two attack dogs and two attack guys. Going to meet some new friends, and see some I've known for 40+ years. With my mother in hospice, it's time for reflection on the old home turf, seeing & hopping on my retired thoroughbred, hugging some good people, and basically getting off the grid. Well, maybe. Just finished up this illustration of Retinopathy of Prematurity for the charitable African flip chart to be used by South African nurses in the field. Can't wait to know when this project is being used in South Africa, in the Province of Kwazulu-Natal. Talk about feeling like I'm contributing some good to the world! It's a great feeling. I date this original carbon dust medical illustration back to 1984. I call this the era of BC, as in Before Computers. That was my left hand in a surgical glove, attempting to hold the surgical retractor steady while trying not to sneeze and destroy everything at once. This was created using dust!! Computers were just on the horizon, and the use of this method of illustration was waning. As student medical illustrators, we learned all of the illustration techniques of the old masters. I think the only time I used this technique was as a student. The method consisted of applying carbon dust, obtained by rubbing carbon pencils against an abrasive surface such as a metal file, to a prepared surface via dry brushes. Highlights were painted on or scratched out later in the process using fine instruments or erasures. A very specialized paper was used. Wonder if it's even made anymore. 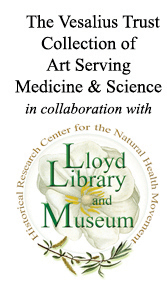 This extremely fragile piece is entering the Lloyd Library and Museum in Ohio as a part of the Vesalius Trust Collection of Art Serving Medicine and Science. I hope to continue to post pieces as they're prepared for shipping.